Home / Astronomy / NASA / Physics / Science / Hubble Just Revealed the Weirdest Galaxy Ever Discovered-- "The Snake Galaxy"
Hubble Just Revealed the Weirdest Galaxy Ever Discovered-- "The Snake Galaxy"
This weird yet amazing Cosmic Snake galaxy is actually behind a massive galaxy cluster called MACS J1206.2-0847, but thanks to the cluster’s gravity, we can see it directly from Earth. Light from the distant galaxy arrives at Earth, having been distorted by the gigantic gravitational influence of the intervening cluster. Fascinatingly, instead of making it more difficult to perceive cosmological objects, such strong lensing effects improve the resolution and depth of an image by magnifying the background object. Sometimes gravitational lensing can even produce multiple images of the object as light is bent in different directions around the foreground cluster. 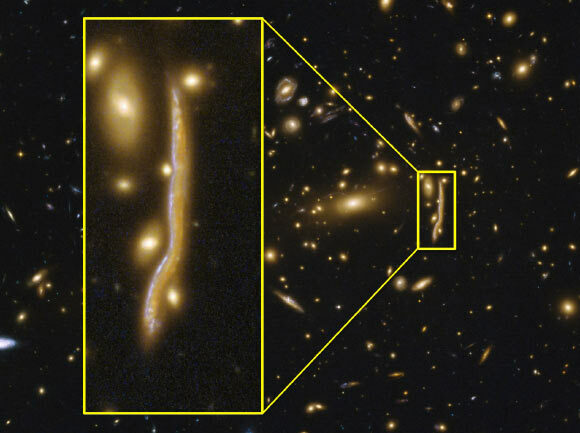 Using Hubble, Dr. Antonio Cava of the Université de Genève and co-authors looked at several such images of the Cosmic Snake, each with a different level of magnification. “The amplified images are more precise, luminous, and allows us to observe details up to 100 times smaller,” Dr. Cava said. The Hubble images revealed that giant clumps in high-redshift galaxies are made up of a complex substructure of smaller clumps, which contributes to our understanding of star formation in distant galaxies. The findings appear in the journal Nature Astronomy.